"Thick, creamy,and delicious. Makes a great summertime smoothie." I'm from Brazil and my grandpa has drank an avocado smoothie practically every morning for years. This is a pretty good one. His are more simple: Avocado, milk, sugar. 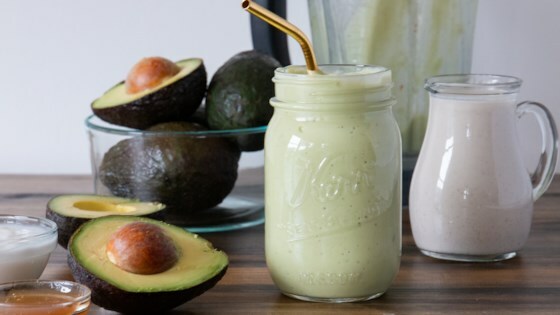 My family and I love avocado smoothie. My ingredients are avocado (of course), sweetened condensed milk (1 regular can), and ice. Blend all and serve. Never heard of this, thought it was weird so I had to try it. It's AMAZING! Literally tastes like sweetened butter. Awesome and very healthy too! Very tasty and satisfying. I made this for breakfast and it kept me full till lunch! Yay! Thanks for the recipe.